The AFRICAN CHAPTER is a blog for Africans and Friends of Africa to share thoughts, news, opinions and and if any self expressions that could lead into political, social and economic developments. We dare to talk openly; inspire, involve, inform and connect. Your comments and posts are all welcome. To post in this blog or to contact moderator or to request your own username and password for posting p'se mailto: sevedo11@gmail.com. Welcome! 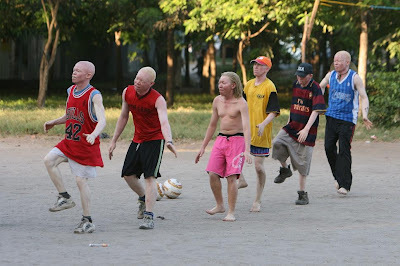 Following the cold-blooded murders and stigma attached to albinism, albinos in Dar es Salaam have decided to have fun like everybody else, by way of forming a soccer team named Albino Magic Team that comprises more than twenty people with albinism. It’s a unique team in the world! Where else? Albino Magic Team headquarters are at the Ocean Road Cancer Centre in the city, train everyday from 16:00 hours at a small pitch, a stone throw from the centre. The idea of forming the team was initiated and developed by Mr. Oscar Haule, who is a non-albinism but moved in advocating for albinos’ human rights, including a right to live peacefully and enjoying life like anyone else does. “We have a myriad of short and long term plans with the purpose of shaking off false beliefs and bad attitudes against people with albinism.” Mr. Oscar told the African Chapter blog yesterday by telephone soon after a peaceful rally organized by the Albino Society of Tanzania. Addressing the gathering President Kikwete said yesterday that the government recognizes the efforts been implimented and implimented, and that his government will strive to overcome the fear and stigma suffered by people with albinism. He also revealed that the plight of albinos is a critical challenge as the tight veil of secrecy behind the vicious murders had frustrated the efforts to contain a situation that has stained the good image of the country. In October 26, 2008 the Albino Magic Team is expected to defeat the MP’s team popularly know as Bunge Team during the match prepared as a curtain raiser during the epic duels between the two arch rivals, Dar Young Africans and Simba. “The team is well prepared for the match. This is our first public match to be watched within the country and outside Tanzania, so we are eagerly interested in telling and showing the world that if albinos and other people with disabilities are empowered can do,” said Oscar who is also a team coach. He calls for people; individuals and organizations, to support the team reach its vision. “We do not have sports equipment and our players are coming far from Ocean Road Cancer Institute. The have to walk a long distance in the Sun to attend daily exercise as we do not have team buses or money for transport”. I support the Albino United! I watched you on TV very very good, keep on going.... Is the best thing you can do! from a big fan of you all! Thanks a lot for providing this nice article. I just saw you play a game on the discovery channel and was so happy when you won ;-) I had also seen a show about the killings and im so sad that you have to fear for your lives. I for one am very proud of you and will give my support in anyway i can. Keep safe and i will keep you in my prayers. You are the voice for the albion's in Africa.....ALBINO UNITED!!! I am so amazed at all of your courage and tenacity. Through all of this adversity you young men have risen above. You are an amazing group of young men. I believe that no man should fear for his life, and it is so disturbing that you have to do just that. I believe also that God made all people equal no matter the skin color, each person is rich with their own unique talents. You young men are going to do great things. Keep up the great work and keep raising awareness. You all are beautiful and I love you for all that you do. May God keep you safe from harm and always watch over you. You guys have gone WORLD WIDE!! I LOVE YOU ALL :) YOU MAKE US ALL PROUD HER IN THE UNITED STATES!! WHOOOOOT WHOOOOOT KEEP SMILING AND KEEP WINNING...YOU ARE ALL WINNERS. Love Albinos, nice article to comments on. Wow. nice basketball team.YOu should purchase electronics like avh-p3200bt and under counter tv for superb entertainment system. This is really great information found here... I'm very happy to be here... Thanks very much! You young men are going to do great things. Keep up the great work and keep raising awareness. You all are beautiful and I love you for all that you do. May God keep you safe from harm and always watch over you. i think each of these young men on the albino magic are extremely attractive. i wish there was a website i could connect with people with albinism becuase they amaze, and flatter me. and of course ive heard about the killings that are being done..i find it ignorant to do such a thing to a beautiful and abundant characteristic being. instead od murdering them, i'd try to reproduce with people with albinism. I love basketball!Check this site out. It's all about affiliate marketing. This is one of the most interesting blogs I have read for a while. 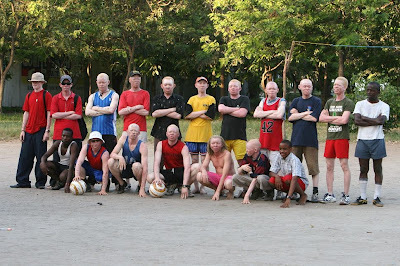 An albino football team in Tanzania, you could not have chosen a better place. I applaud your motives and love the training routine. Keep us informed of the scores. Sport is something that crosses all divides. Very useful information for me. On the bread crumbs until I realized'll deal with time. I'll try to implement all the recommendations in their practice. Thank you. I run a flip video camcorder website. I love using the Kodak ZI8 video camcorder as well as the Flip UltraHD camcorder. They take great video and are easy to use. These people are really amazing!! I am wondering if you knew of any community forums that cover the same topics. I think this is a really neat idea for those who are Albinos to form there own soccer team. Lots of camaraderie and fun. I hope this works out well. I like your post very much. You have a good writing style. Whenever I get time I am going to visit ur blog. That is such a great thing. I think everybody should have a chance to participate in life. It is a shame what happens to these poor people just because they are different. phil@seo manchester Thank you as sharing this know-how. I found this advice in truth helpful. And that is a wonderful content. Return how to read through A few significantly more. Really there are many useful things which will very helpful for us. COOL! Goood luck to the team! Is any way to watch there work's video It's inspiration for others nice to read this blog. I feel sad when watching those albino children. This is actually helpful for any work related stuff. Absolutely great. Venapro helps you treat them naturally and safely at home. Read what other users are saying about how it has helped them finally get relief from painful hemorrhoids along with helpful information about what symptoms to look for and how to treat them. Thanks-a-mundo for the blog post. Thanks Again. Keep writing. I am a big fan of basketball. My favourite player is Kevin Garnett. Check out these websites, its all about breast actives and how to get my ex back. I love your blog as it is just what I’ve looking for and excited to read all the posts. Thanks for sharing. This post is great! I used to play basketball in my primary school. rapid profit formula is the latest niche affiliate marketing course by Matt Carter. Learn how to beat eczema today! Among all the topics that can be discussed on here, I will rather choose the social part, not economic and politics. These two kinda make me get a headache! lol! Congratulations for the outstanding weblog posting! I found your post actually interesting, I believe you’re a clever writer. I add on your weblog to my bookmarks and will return throughout the lengthy term. I need to encourage you to continue that marvelous operate, have a very good day! I watched Albino team on the tube a while back, very good, keep it up guys and all you need is to keep pushing forward and have self confidence. Thanks for making this article this is really great!!! a very interesting blog you have here. Africa is a place where I want to visit. Although some part of it might be less developed, I can imagine people over there are pure and life loving. Need to go there sometime in the future. You all are beautiful and I love you for all that you do. May God keep you safe from harm and always watch over you. You young men are going to do great things. Keep up the great work and keep raising awareness. Some of the park scenes (with the swings) were filmed at Hillcrest Park (Christie and Davenport). The park was covered with fake snow for at least a week. that looks like quite a basketball team. If you need to learn how to ship a car because you are shipping a car across country just ask. What a nice basketball team!Best info about:mastercard prepaid debit card,transfer money abroad,green car insurance. Very useful publish here. Thanks for sharing your knowledge with me. I’ll definitely be back. I used to see some albinos when I worked in Zaire in the 90's. I felt so sorry for them as they used to suffer terribly under the sun. I love the info on this blog, i will be coming back often. All the best to the Albino team. Its really great picture. Everybody should enjoy this game. nothing like a good game of soccer. p.s if you need no upfront fee credit repair check these guys out. forming a soccer team and using sports / games to bring about harmony is a nice way to overcome all the violence. I am glad to see that people are actually writing about this issue in such a smart way. This articles helps me more.Thanks for your sharing,I will pay more attentions to your blog. I came from a post on how to stop a puppy biting to this one and just found this story so inspirational. Keep up the great work. What a great football team. I hope that you guys will win the tournament to prove to the world that a disabled person can enjoy and live life to the fullest as well. I was looking for ways on how to get rid of sinus pressure and treatments for sinusitis information until I came across and decided to read about it. Awesome post! Good luck to your team in the upcoming games. feels good to see such things happening in a country like Tanzania. P90X , you will love this. Really nice information about you blog, I think I will spend more time on it, great online work! Thanks for Sharing this amazing pitcher and Article..
You are know about this team..
Awsome post i ever seen.I bookmark it. This is a really thought provoking topic thanks for sharing with us. Great article keep sharing the knowledge and opening eyes! Wow, this is such a good concept :-) good luck to you guys. It makes me want to get nox360 and nox edge right away. Great pictures, I would love to see them in action. Excellent blogger, Thanks for producing this prestigious blog. I found it useful. Kind regards!! I have seen a lot of blogs but i really like the layout of yours I wish that you will continue posting your knowledge with us. complete way of writing? I have a presentation incoming week, and I am on the lookout for such information. I wish you guys a great basketball season! Hi..Really i appreciate the effort you made to share the knowledge.The topic here i found was really effective to the subject which i was researching for a long time..
On the killings of People with Albinism, Should Tanzania Abolish Death Penalty?